That’s the takeaway lesson of the last few weeks on my £35 model railway project. But first, let’s catch up with the project’s progress. As mentioned in my previous post, I’ve got little track to work with so the layout is going to be small and as a result, I’ve decided to base the railway in a box. My first thought was to use an old wine box. The wooden ones you see in wine merchants. Eager to get started I rang various wine local merchants and scoured eBay. It was then I ran into a potential show-stopper of a problem. Maybe I’m old-fashioned, but in my naivety, I thought a second-hand wooden box would be cheap. Hahaha. How stupid of me! No matter who I spoke to I was quoted silly prices. Some wanted £25 for a box! The lowest I found was £15. Ouch! What a rip-off and beyond the budget, I’d set myself. Scratch the wine box idea. After a few glasses of consolatory wine and increasingly impatient I went shopping on eBay and found a wooden crate for £7.59 plus £2.98 postage. This is more than I wanted to spend but still within the budget. It also measured 40 x 30 x 20cm. For an OO gauge layout, these dimensions are really pushing the limits of what’s possible but the track plan fits, just. Itchy to get started, I ordered it. With the container taken care of my attention turned to track and I headed for a local boot fair. Halfway around the stalls piled up with old cups and picture frames I found a small collection of Hornby rolling stock and assorted track perched on the end if trestle table alongside some Thomas track and assorted ornaments, toy cars. The rolling stock was in a poor state but the track looked okay and after a bit of haggling, the seller agreed to let me have a couple of straights, two curves and a left-hand point for £5! An absolute bargain and just what I needed for my track plan. 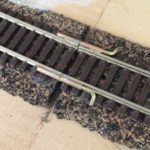 (Aron, who has joined me in the challenge, got a lot more track for his layout – 15 pieces of track and 7 sets of points – while still staying on budget). I now had the basics to begin construction. One of the problems with railways in boxes is the viewing angle is invariably downwards. It also constrains building, limiting access to the top down. I wanted to avoid both these problems and so cut out two of the slats at the front. I left the lowest most slat in place so it conceals the front edge of the layout and maintains some of the structural integrity that would otherwise lose. With easier access and viewing via the front, I then started on the insides. The first challenge was that as the box has a flat bottom there is nowhere to hide track wiring. 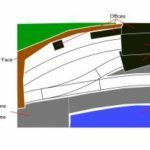 While thinking about this I also realised that my plan features a harbour dock area at the front and the water level for this will be below the ground level of the rest of the layout so a two-level design was needed. The only solution was to artificially raise the ground level of the layout in the box to hide the wires under the layout and a recessed area could be cut out for the dock. Some old Polystyrene packaging used for this as seen in the photo here. With this in place, the track was cut and fitted into place just to ensure the measurements were correct and the track fitted, which it did – thankfully. The track has since been removed so tunnels for the wiring can be cut into and under the Polystyrene. Exit holes, on the left where the track meets the side walls, are also needed. These will allow for future expansion options (a fiddle yard springs to mind). Before this, however, I wanted to fit a measure to improve loco running. 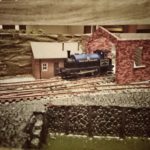 In the past, I’ve had ‘unfortunate’ experiences with uneven trackbed causing locos to derail. 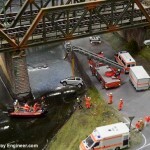 (Even a millimetre bump in the track bed can cause locos problems, particularly short wheelbase engines crossing points. This was discussed in-depth here). To hopefully prevent this, some cereal packet cardboard (shreddies for anyone interested) was cut to the shape of the track bed and laid on top of the polystyrene. Once checked with a spirit level and metal rule to be certain it was absolutely flat this was glued down with white glue (PVA). Next, it’s time to acquire the DC controller, wires and switch to flip operation between the two tracks, solder the wires to the rails and then lay the track. I’ll get to this next month, as per the schedule, but I’m already falling behind Aron who has steamed ahead with his layout. As mentioned, he got shrewdly picked up a job lot at an absolute bargain and this has allowed him to move on quickly. His track is down and he’s already working on some of the buildings. I need to catch up!! My running total so far. Budgeted for items purchased so far, £15. Spent £15. So far, and amazingly, I’ve stayed bang on my budget and to my construction timetable. 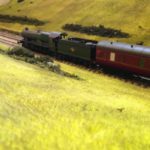 Quite simply; rushing things, especially model railway building, is likely to result in mistakes that will cost more in the long term. In my case, I rushed to get the box and track and ended up spending more than I needed to. Days after buying the crate on eBay at the boot fair where I picked up the track I spotted a wine box (being used to hold old photographs) for which the seller wanted only £6! If I’d been more patient and taken time instead of rushing I could have save £4 and had more space for the layout. Frustrating and it’s taught me to slow down. If I’d just waited before buying the crate I’d have saved £4. While this tiny amount normally it’s over 10% of the total budget for this project and money that I could really use elsewhere in the build. 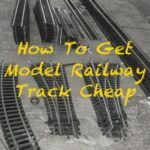 This is a lesson that applies to all aspects of building a model railway, from track laying to waiting for paint and glue to dry fully dry, it takes time and rushing things will cause problems later on or end up costing you more. Having said all this, there is one thing you should rush. 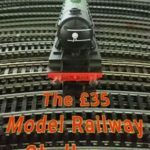 Join me and Aron and build your own £35 railway, starting now. 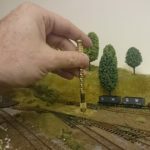 What boxes do you have lying around that you could put a railway in? Have look and let me know in a comment below. Love your ideas. You are doing great work. Keep up your work.